9Can Your Kindred Spirits Be Pets? Everything in life is made up of energy. As people, we all resonate at various frequencies throughout the day and over the course of our lives. That experience we have when we automatically ‘click with’ someone is a simple matter of energies matching. Kindred spirits are those people that resonate at our same frequency or level. While these beings don’t necessarily play a particularly impactful role in our lives (like, say, a spiritual teacher might), they do provide a great deal of comfort and support. Kindred spirits often share personality traits, values, tastes, and interests. They can range from deep and intense relationships, soul mates and soul family, so friendly and encouraging acquaintances. Kindred spirits have a way of highlighting our own gifts and potentials. 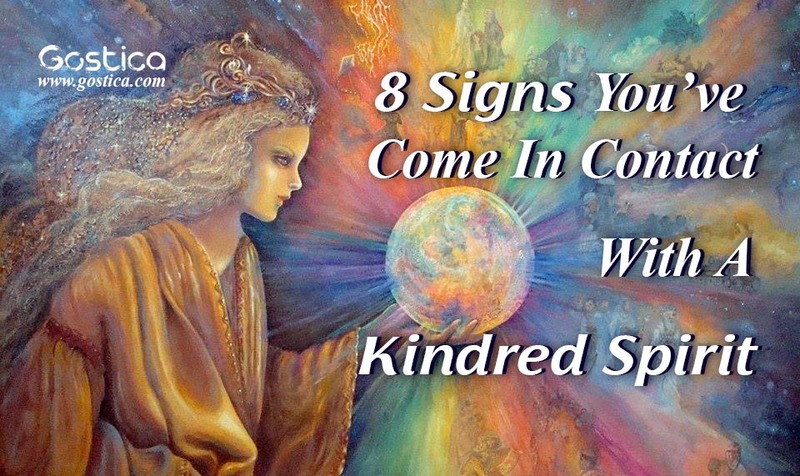 So how can you tell who your kindred spirits are? Your intuition will give you the biggest clue. It often comes in the form of an instantaneous knowing that you have just connected with someone special. You are likely to share the same political views, religious beliefs, and/or ethics as your kindred spirit. There is always room for difference, you shouldn’t expect to find a clone, but being in the company of a kindred spirit is usually easy. You won’t often disagree with each other about the things that matter most to you. Even though there will be some differences between you, as kindred spirits, you will always feel a sense of respect for him or her. There are a natural trust and understanding between you. This sense of support leads to a wonderfully encouraging and supportive relationship. Respect is one thing, honesty is another. A kindred spirit will always be honest with you, even if it’s difficult (maybe even especially if it’s difficult). Like most relationships, kindred spirits aren’t going to show you only what is good in life, but what is true. And as we all know, what is true can be difficult to assimilate. But our kindred spirit is right there supporting us through it. There is no end to what you can teach and learn from each other. It could be a new way of thinking, acting, or living. A kindred spirit can bring you a new perspective and greater objectivity. No matter how difficult the issue, kindred spirits have a tendency to be great mirrors for us. We learn by watching them with openness and compassion. That feeling that you’ve known someone for an entire lifetime, even when you’ve just met, is such an incredible feeling. This is one of the strongest signs of a kindred spirit. When you vibrate on the same frequency as someone, you will find so many other similarities between you. You’re at the same spiritual level and this impacts your everyday life. As you help each other raise your frequencies, a deep understanding develops, allowing for greater respect, honesty, and ability to learn from each other. You’ll find that you and your kindred spirit have experienced similar adversity in life. That’s part of what it means to vibrate at the same frequency. You attract those people who have dealt with what you need help with. He or she will have the greatest empathy for what you are dealing with. The support you’ll receive will be so comforting and you may find yourself saying that you couldn’t have gotten through without them. The reverse is also true. You will be able to help people who have the same life experiences as you. A kindred spirit is someone that you don’t have to wear a mask around. They are probably a great deal of fun, bring you joy, and enrich your life with their presence. There is no truth that you will feel the need to hide from your kindred spirit. You will complement each other and therefore accomplish more as a team. Perhaps they are the visionary and you are the doer. Kindred spirits make great business partners in this sense. The trust is complete and the partnership is well-rounded. A kindred spirit is that person who calls you unexpectedly on the very same afternoon that you are struggling with something. Their intuition told them to call, and they did. If you say you are fine when you don’t mean, they will know, will lovingly call you on it, and support you as your process what has happened. A kindred spirit has the knack of always asking the right questions at the right time. They are on hand with either the pint of cookie dough ice cream or a kick in the rear – whichever is most helpful in the moment.